Cartels Make Crossing U.S. Border Even Riskier The trip across the border has always been perilous, but some Mexican drug gangs are now earning millions each year by extorting and smuggling migrants. Despite the increased danger from the cartels, one 15-year-old who was deported after reaching the U.S. says he'll soon try again. 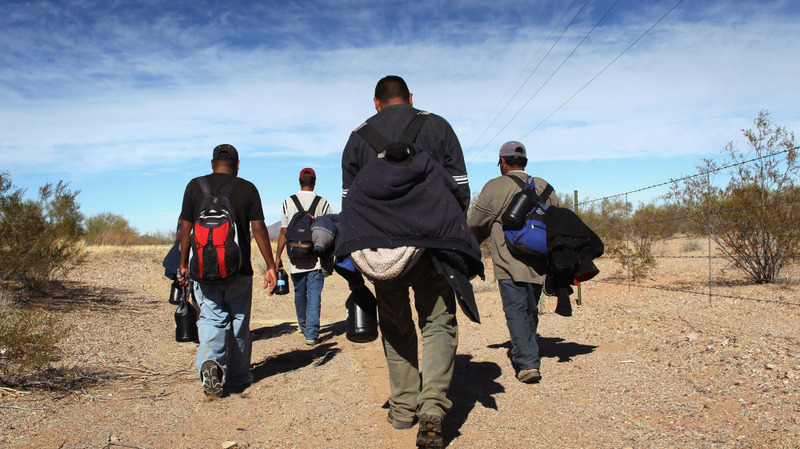 Undocumented Mexican immigrants walk through the Sonoran Desert after crossing the U.S.-Mexico border. Migrants attempting to cross are at risk of being kidnapped, extorted or even killed by drug gangs. Gang members openly sell pirated gasoline that they've stolen from government pipelines, and lookouts for the drug cartels monitor the south bank of the Rio Grande to make sure no one tries to swim across who hasn't paid for the privilege. While the overall number of migrants trying to cross illegally into the U.S. has dropped dramatically over the past few years, the trip has grown more dangerous, as some of Mexico's most brutal drug cartels now earn millions of dollars each year from the extortion and smuggling of migrants. Last year, hundreds of migrants went missing or were killed in Mexico, and more than 20,000 were kidnapped. The couple is staying at a church-run shelter. They've heard about other migrants getting kidnapped, robbed and beaten here. They don't have the bus fare to return to Tabasco, but Perez worries he'll get abducted if he goes out to try to find a job. "The truth is ... I'm afraid to go out in the streets," he says. Perez says they wanted to go to the U.S. to look for work. Now they just want to go home. Catholic priest Francisco Gallardo Lopez runs the shelter where Perez and his girlfriend are staying. At his office attached to a simple white church, Gallardo says the situation for migrants has deteriorated significantly over the past few years. The drug cartels have turned the extortion of migrants into a highly sophisticated, and lucrative, criminal enterprise. Migrants are abducted and held in so-called safe houses until family members pay ransoms of hundreds or even thousands of dollars for their release. The migrants are regularly beaten. "In the past, ordinary smugglers abandoned them, extorted them; but now physical abuse is the norm. And it's very strong and very serious," Gallardo says. Hundreds of thousands of people, mainly from Mexico and Central America, attempt to sneak across this border into the United States each year. And last year alone, almost 400,000 were deported. Carlos was just deported a few hours ago, but his situation is complicated because he's only 15 years old. He's being held by Mexican social workers until an adult relative comes and claims him. They asked that NPR only use his first name. Carlos says the coyote took a group of 30 people, mostly young men in their 20s, and ferried them across the river in an inflatable raft. A small white van and a car were waiting for them. The migrants spent the first two days hidden in a house in McAllen, Texas. Then they were all crammed back into the vehicles, Carlos says, and driven out into the countryside. "We were all squeezed in. You nearly suffocated in there, too," Carlos says. Outside McAllen, they were told they were supposed to meet up with some other guides who would walk them around several Border Patrol checkpoints. "The coyotes who were supposed to take us weren't there," he says. "We woke up the next day and we didn't have water. We didn't have food. So what were we going to do there in the woods — die out there?" Eventually, the coyotes showed up. Carlos says the group would hike to a spot where the van and the car were waiting. They'd ride a little ways, then get out and hike some more. Carlos says this went on for five days, and the guides never brought them anything to eat. "Mostly we were just drinking water. And then at one point we went a day and half without any water," Carlos says. Then, just outside Houston, the group was caught by the Border Patrol. If all 30 of them had made it to the city, the smugglers stood to make $90,000 for the one-week journey. Carlos is from the central Mexican state of Morelos, and his family works in the sugar fields. He says all of his uncles are in Texas and he has always expected that he'll join them. He'll go back to Morelos temporarily but says he is not going to stay there. "After a little while, I'm going to go to the United States. I'm going to come back again," he says. This burning desire to get to the United States is a huge problem, says Alejandro del Angel Pena Jara. Pena works with the Mexican social service agency in Matamoros that deals with deported minors. He says kids are putting their lives at risk to try to get across. One of the biggest dangers is just drowning in the river, but Pena says recently the migrant journey overall has gotten much more hazardous. "We've had cases where young girls, teenagers, are raped. Cases where migrants are injured when they're attacked either with firearms or a knife. There's the problem of them being used to smuggle drugs across or money," Pena says. What worries us is they're going to expose themselves again to these dangers, or risk their lives to return to the United States. Each day on average his agency gets handed one or two Mexican children who are being deported from the U.S. Some of them have lived in America most of their lives and don't even speak Spanish. But Pena says the most common cases are kids between the ages of 12 and 16 who are trying to join their parents who are already in the United States. This poses a problem for him because often he has to call those parents, who are in the U.S. illegally, and have them come down to Matamoros and collect their teenagers. "We believe that they're then going to try to cross again," Pena says. "If you have your house, your family, your studies — everything — over there in the United States, the most logical thing is that you're going to try to cross back. And what worries us is they're going to expose themselves again to these dangers or risk their lives to return to the United States." And with the drug cartels' increased control over the smuggling of migrants, that return journey is getting more difficult and more dangerous.